This was followed by questions and answers. Tony Martin of the Peoples Vote campaign spoke in favour of giving the people a new vote over Brexit. This followed the stalemate and inability of the government to put forward any unified Brexit option. Who should resolve this - May and her shrinking band of supporters, Westminster or the people? He talked about the Peoples Vote street campaign in East Lothian. Some were worried about the boost that any attempt to rerun the Brexit referendum would give to the hard Right, with their shouts of betrayal and taking to the streets. You can not write off all Brexit voters as racist and many held quite legitimate grievances over the EU. The conduct of the EU towards Greece should not be forgotten. There were real limitations on what a Left government could achieve within the EU. Others argued that the hard Right would make advances, in both the dump Brexit and Brexit scenarios. In the dump Brexit scenario, though they would face a major defeat, since Brexit has been at the forefront of the Tory Right, UKIP, BNP and EDL agenda for some time. The Far Right would go ballistic, but they would not have become politically mainstreamed. In any Brexit scenario, the creation of a new border and the stepped up immigration laws, would provide the far Right with the scope for vigilante action to supplement the already very reactionary UK laws and state activities over immigration. Many of the hard Right's arguments would enter the political mainstream. Their position in relation to the UK state would more resemble that of Loyalists to the old Orange Stormont regime. There were also major limitations in what you could achieve in the UK, with its anti-democratic powers and subservience to The City. The need to place an emphasis on the plight that EU migrants and asylum seekers now faced was agreed by all. The need to understand the reasons why many workers voted for Brexit, and not to dismiss them as the liberal elite did, was also agreed. As a consequence of Brexit, some of the middle class was now experiencing the economic blows for the first time that had fallen upon many of the working class for decades as a result of Thatcher's neo-liberal offensive. There was a discussion about the need for new types of organisation to replace those that the neo-liberal offensive had broken up, and those still existing bureaucratised unions, which were no longer fit for purpose,. The possibilities of community-based unions were discussed. Although fewer young people were involved in trade unions, their willingness to become involved in campaigns, which challenged the current order, was also emphasised - Occupy, the Radical Independence Campaign, the Living Rent Campaign. MeToo, and now Extinction Rebellion. Cat has been a prominent member of RIC. T She has her own column in The National and the views she expresses are personal ones. Cat's article argued for a new Lexit or Left Leave campaign. 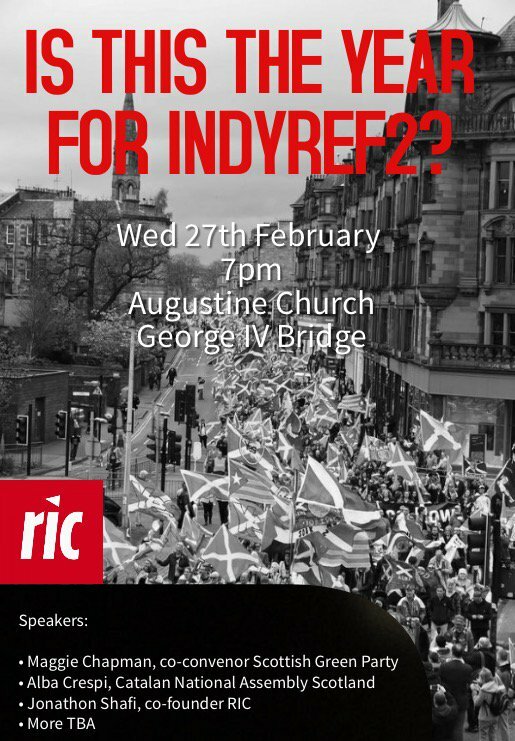 RIC does not have a position on Brexit. We have Remainers, Leavers and Abstainers amongst our members and supporters. However, RIC has never been afraid of organising debates around this issue, as the discussion on 18.11.18 shows. Allan Armstrong sent a reply to The National on 27.11.18, which, knowing space would be limited, only addressed one aspect of Cat's arguments. This letter was not published, so we are posting it below, as a further contribution to the debate. Cat Boyd has provided a damning indictment of the Lexiters in and since the Brexit referendum campaign. Yet she still tries to offers her advice about how a Lexit campaign could be revived. In this Cat completely ignores the elephant in the room - the creation of a new border. This is fundamentally what Brexit is all about. The Lexiters and Right Brexiters both want a strengthened UK border to keep out the aspects of the EU membership they don't like - for the LexIters - the EUs neo-liberal constraints on public spending and nationalisation; for the Right Brexiters - the EU's workers', consumers' and environmental safeguards. However, they are united in accepting that Brexit means the ending the free movement of people within what has been the wider EU. The EU, in relation to its citizens, guarantees free movement from which millions, including UK subjects, have benefitted. The EU, in relation to the outside world has the Schengen Wall, which has contributed to the deaths of thousands of asylum seekers and migrants. What has been the UK's attitude to Schengen? The same as its attitude to workers right's - it wanted exemptions to impose worse conditions. For successive UK governments, the 'walls' weren't high enough. This led to the degrading Calais camps. When asylum seekers and migrants were desperately trying to cross Mediterranean Sea, and drowning in their thousands, the British navy, stationed at Gibraltar and Cyprus, only rescued a handful. The navy's main task was getting involved in, or providing logistical support for, US bombing in the Near and Middle East. Yet it was these brutal attacks on Libya, Iraq and Syria that had mightily contributed to the exodus of millions, who were mainly absorbed by their neighbouring poor countries. Some did make it to the EU's shores. How did the UK address this massive humanitarian crisis it had helped to create? It took in 187 Syrians, compared to Germany, with no Mediterranean navy, taking in 30,000. We now have the new UK/EU Deal. May is touring the country trying to sell it. What does she claim is its greatest benefit? She says that the UK can now control immigration. The human tragedy of detention centres like Dungavel and Campsfield, and the draconian 2015 and 2016 Immigration Acts, are not enough. Nobody is challenging this - certainly not Corbyn. This is because he also accepts the need for a new border. Both May and Corbyn want this border to be porous for commodities and profits. The makers of those commodities will be denied free movement, whereas the takers of those profits will retain free movement. There is already a glaring gap, whereby Saudi Arabian billionaires with their domestic slaves, and Russian oligarchs with their gangster entourages have free movement (paying Tory MPs handsomely to look after their interests), whilst the cruelly injured victims of British bombs and arms sales in Syria and Yemen are excluded. People as people get abandoned under any Brexit Deal. What Brexit in any form will lead to is a new harsher system of immigration control. Both May and Corbyn are moving towards a form of the old German gastarbeiter system, whereby employers decide upon the labour they want. The state will enforce a hierarchy of contractual rights. These will determine the length of stay, the level of pay and working conditions, and access from other countries by family members. This will involve vastly increased state surveillance, which the Far Right will supplement by vigilante activity and worse. The Tories will relish this new opportunity for divide-and-rule, Corbyn will be shamefaced about it. However, the racist politics reinforced by any Brexit will dominate, since if you try and set up a new border, these go with the terrain. Lexit had not been able to escape this in the past, and nor would its revival be able to do so in the future.